Robert “Bob” James Stoker, 85, passed away on Sunday, March 24 at Carrollton Manor. He was born May 9, 1933 and raised in East Springfield Pennsylvania, the son of Marie and James Stoker. He moved to Indiana after graduating from Taylor University and lived in the Richmond, Indiana area until moving to Georgia in 2007. He leaves his wife of 63 years, Lois Stoker, his daughter Rebecca and son-in-law Mike Gentry, his son Robert Stoker and daughter-in-law Carol, and daughter Elaine and son-in-law Scott Hobson. He leaves 9 grandchildren and one great grandson. He also leaves his brother Richard Stoker and wife Diana. Bob married Lois Weed Stoker in 1955. Bob graduated from Taylor University in Indiana, and began his long teaching and coaching career, after briefly serving in the army after the Korean War. He obtained his masters degree at Ball State, Muncie, Indiana in 1960. He taught math and coached basketball and baseball in the Richmond, Indiana area for 35 years. 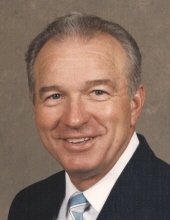 A life long lover of sports, Bob played golf, baseball, and basketball, and loved coaching. A firm believer in the Christian Faith, Bob was an elder, sunday school teacher, and leader at First Church of Christ, in Lynn, Indiana. Robert was a lover of music, played guitar, and sang. A positive, loving person, he would always help those he loved without question. Family was his biggest priority, as he devoted the majority of his time to helping his wife and raising his three children. His family remembers him as a happy and kind father and grandfather. Funeral services will be conducted Wednesday, March 27, 2019 at 3:00 PM from the 1st Christian Church in Carrollton with Rev. Randy Barnhart officiating. Pallbearers will be Mike Gentry, Scott Hobson, Bob Stoker, Evan Stoker, Ron Shepard, and Will Hobson. Interment will follow in Carroll Memory Gardens with military honors presented under the American Legion Post #143. The family will receive friends at the church on Wednesday from 2:00 PM until the time of service. Messages of condolence may be sent to the family at www.martin-hightower.com. Martin & Hightower Heritage Chapel has charge of the arrangements. To send flowers or a remembrance gift to the family of Robert "Bob" James Stoker, please visit our Tribute Store. "Email Address" would like to share the life celebration of Robert "Bob" James Stoker. Click on the "link" to go to share a favorite memory or leave a condolence message for the family.